Welcome to the first installment of digital hobo, a comic that is very near and dear to CB and Tony D’s freelancing hearts. It’s like a little window into the daily struggles of all freelancers. 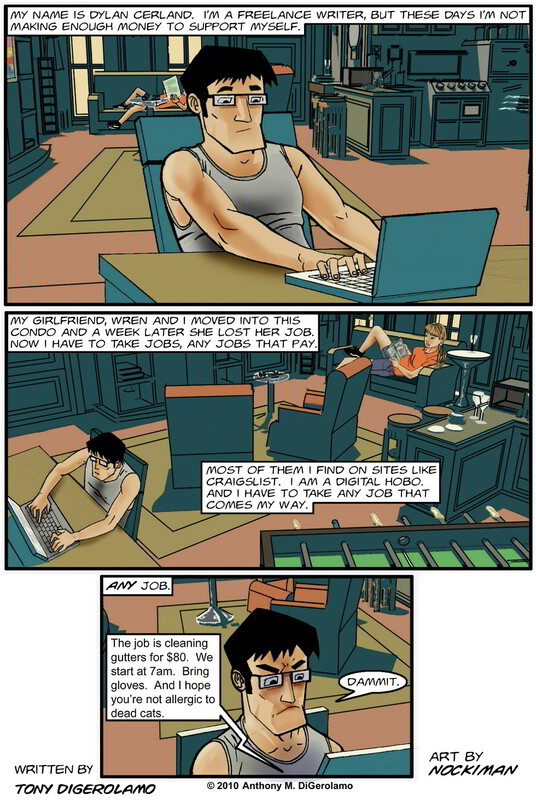 The Webcomic Factory » Friday on the Network: digital hobo Returns! Very excited to debut this! We’re going to be putting Dylan through a lot of crazy jobs and adventures on his quest to find a quiet moment to write. KEWL!!!! great job on the backgrounds… it looks great! So excited to see this up! But hey, his GF is reading a magazine?? She should be looking for a jobbbbbbb!! LOL! She finished looking an hour ago! Give her a break Maxine!